A large group had gathered under the trees. They huddled together, collars upturned and fists drawn up into their sleeves for warmth. Close by stood a small girl, a scrap of a thing, in a shabby old coat. As trees wavered, adrift in the squall, she covered her face, peering through fingers at the gathering swell. ‘See!’ she gasped suddenly, her voice snatched by the wind. ‘See the wind!’ It was coming in sea blue waves across the fields. ‘Tell the Others what you see,’ the wind seemed to urge. The girl took a deep breath and braced herself. Her face shone and around her neck, on a silver thread, hung a little heart carved out of stone. The wind now billowed over hedgerows, driving rain clouds – grey on grey – ever closer. Laughing she lifted her arms, her old coat flapping about her like seagulls’ wings. Swirling currents of air broke at her feet and she jumped, riding waves that only she could see. ‘How bright and blue the wind is!’ she cried. The wind played around their ankles, dallied with last year’s leaves, driving them into puddles and corners. ‘Who does she think she is!’ one cried. ‘Who do you think you are!’ echoed another. Branches rose and fell queasily above them, wet leaves spun limply to earth where they sheltered. But soon the skies began to clear and the wind grew calm. Weak sunlight had leaked through the branches and a rainbow appeared. The girl gazed in delight at the shining arc but, tired of her imaginings, the Others moved off. Their voices grew loud: The wind is invisible! Invisible! ‘Wait!’ The Girl Who Watched the Wind hurried after them, her feet crunching on the gravel path. The heart of stone on the silver thread beat, heavy, against her chest. How could they possibly not see the wind? Surely everyone saw the wind. But their words echoed in her mind and, uncertain now, she cast about her for another glimpse of the sea blue waves. ‘Are you there?’ she called to the wind. ‘Are you there?’ she called to the Others. Birds whispered then scattered like darts. 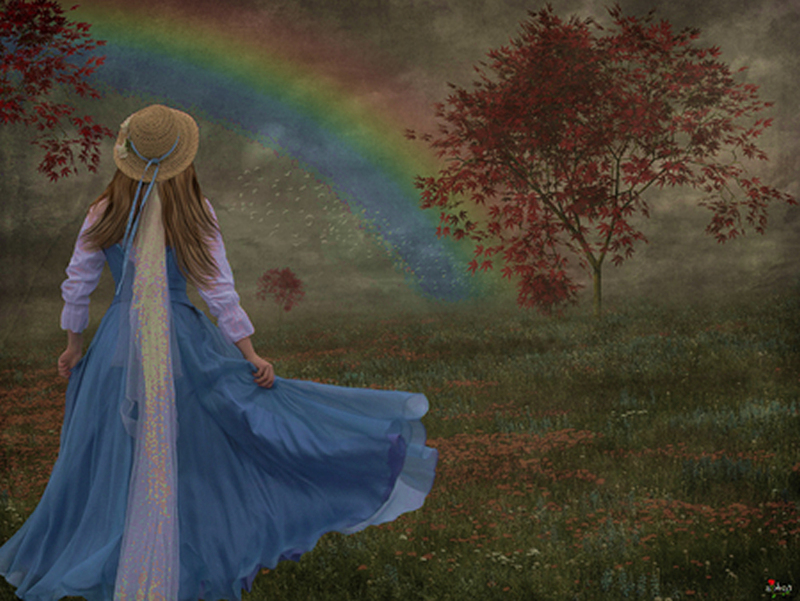 The girl’s face still shone as the last of the clouds disappeared and the rainbow faded. The afternoon grew suddenly warm. Soon a Great Silence, as bright as sunlight, fell over the land and together in the Great Silence the girl and the wind paused. Hearing the voice of the Silence, the girl smiled. Touched suddenly by the wind’s breath, a sharp-eyed blackbird turned and regarded the girl. He too shone like the sun. ‘I am …,’ he sang, ‘I am …’ and with an eye to the heavens he shook out his wings. Unswerving he soared, so high that his light soon disappeared from view. But the light in the girl’s heart soared with him. ‘What purpose the little bird has!’ she marveled. ‘And what strength of spirit,’ said the wind, lightly brushing her arm. The Others had now reached the road. It glistened in the heat. Glimpsing them the girl ran on, her feet splashing through puddles warmed by the sun. With her friend the wind at her back she cut across the field. Here poppies nodded and swayed in the Great Silence. Seeing their beauty she gasped. ‘Who are you?’ she called, stumbling over the furrowed land. ‘I am,’ they mouthed, each lipstick red, and scattered their petals into the arms of the earth. Weighed down by the old coat and the heavy heart carved of stone, the girl sat down while the wind played happily in the trees. The earth slept beneath her, untroubled by the wind. Softened by the storm it was warm and heavy with the seeds of unborn life. Sensing her presence the Spirit of the Earth awoke. ‘I am,’ it murmured. ‘I am,’ and the girl lay back in the arms of the earth until the wind returned. The Others towered above her but unafraid the girl took a deep breath and spoke of all she knew. Glowing, she told them of the wind and the Great Silence, the blackbird and the poppies and the Spirit of the Earth. She told them of God. But the Others, uneasy in her light, hid their laughter behind their hands. ‘Who do you think you are!’ they scoffed. And again the girl said, ‘I am,’ but her words were lost in their laughter. ‘There is no God!’ they taunted and, heads bowed, they continued on their way. Soon they forgot the Girl Who Watched the Wind and their footsteps disappeared over the hill. Puzzled, the girl followed. No God. No God. Their words had cast a blanket over her soul. The sun was now low in the sky. At once the blanket of doubt fell away and the girl smiled, radiant once more. ‘I am,’ she said and her words were snatched once more by the wind and carried across the land. I Am … I Am …I Am …echoed brightly over the horizon and disappeared with the last of the sun. The layered scents of evening drifted on the air and darkness settled over the fields. ‘Come home!’ cried the earth, drawing her body close. Suddenly tired the girl lay down, her old coat muddy and torn. Alone with the wind and the comfort of wood pigeons she entered the great silence of sleep. And as the silver thread (already frayed) gave way, her heavy heart, carved of stone, fell free. Morning followed and another night, and at last the Others returned. ‘Come home!’ they cried to the girl who was not to be found. ‘Home,’ she sighed and cast her old coat to the wind. ‘Come home,’ a blackbird sang and spread his taffeta wings. Gleaming he soared until, reaching the heavens, he drew down the light of seven stars. ‘Come home,’ beckoned the stars, lighting her Path of Return. Touched by their light, the Others lifted their heads. Sea blue waves moved gently now across the earth and the Girl Who watched the Wind awoke. Light of heart she rode the wind, oh such a scrap of a thing, until she came to a silent shore. And together they rose, weightless between worlds, higher and higher still to the soundless, groundless Light of No Beyond. There in the flow where there is no before and no after. ‘Home,’ her heart sang as it beat with the silent pulse of the wind. ‘Come home’ is ever the empty call of the earth. ‘Come home,’ the Others still cry to the Girl Who watched the Wind. For years they have gathered by the little church with high windows, its heavy doors now open wide. They enter now, their footsteps clattering on the cold stone floor and, heads bowed, sing their half-remembered stories – of her lightness and laughter as she watched the wind, her flapping like a sea bird and the rainbow when the rain had stopped. Hearing their song she hovers once more like a ghost between worlds. After many dusks and many dawns the girl, at last, is near. But now she is one with the wind and one with the earth. Returning, she is one with the sharp-eyed blackbird and the poppies and the Great Silence. She is even one with the Others. Her bright heart glows in the sun. ‘Are you sure?’ the stranger asks. A gentle breeze has found the open door. He wears no coat and the Others gather round, concerned that he might catch a chill. ‘See!’ he says. ‘See the wind?’ Birds whisper and scatter like darts as the wind grows strong. It carries in the scent of lavender and old suits, brought out for these occasions. It comes in waves, little waves which (even for a moment) they almost believe they can see. ‘And who are you?’ they ask at last as sunlight streams in through the high windows. A regular contributor to Inspirational Storytellers and member of the editorial team, Moyra is a writer, editor and artist who has been involved in healing and spiritual growth work for over 30 years. Her first two books, ‘Take me to the Mountain – discovering the you that never dies,’ and ‘Fiery Love, a companion for challenging times’. She has recently completed a fascinating new project - an exciting novel for children and adults called ‘Amelie Trott and the Earth Watchers.’ Watch this space for further updates! Beautiful story.Thank you also for bearing a message from my beloved (in spirit as yet) who I asked to give me a sign of his closeness by showing me blue. And here is your blue wind!! I am so delighted, yes,. I AM!